Today is the first day of Disneyland Resort’s Lunar New Year Celebration! Which of course means lots of delicious food booths, as well as a special themed menu at Paradise Garden Grill at Disney’s California Adventure park until February 17, 2019. I was pleasantly surprised at the amount of vegetarian options they have. Aside from desserts of course, there are two vegetarian and one vegan item (a good amount considering the shorter run of this particular festival). 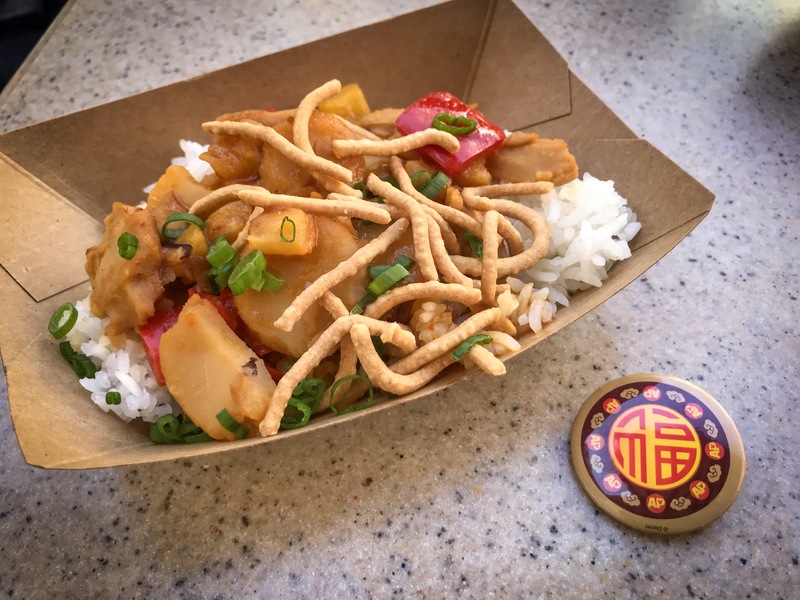 This year is the first time Disney’s Lunar New Year Celebration has a Sip & Savor Pass! Exclusive to Annual Passholders, you can purchase for $36 to give you six food or non-alcoholic beverage items! Sometimes I find Sip & Savor passes don’t help save money if you’re only eating vegan or vegetarian items, but with most the items $7 or more it did help me save money! This booth has the vegetarian vegetable egg roll with chilled garlic noodles. The noodles were very garlicky, but I love garlic so I enjoyed that! The egg roll was very crispy, and not greasy! It was delicious. This booth, right next to Longevity Noodle Company, has the vegetarian option Stir-Fried Vegetables and Pineapple with Soy Protein. This felt like the most hearty of the options, and was my favorite! I would definitely get it as a repeat go-to for lunch! Paradise Garden Grill has Lunar New Year’s vegan option, Vegan Orange Tempeh. And of course we all know that food tastes better Mickey-shaped…so this tempeh is shaped like Mickey! You can get a full potion, or use a pass from your Lunar New Year Sip & Savor pass for a snack-sized portion. The tempeh is spicy, which was nice combined with the orange glaze! More Fun at Lunar New Year! Also over by Paradise Garden Grill, you can find a meet-and-greet area. Rotating in the meet-and-greet area are Mulan and Mushu, and then dressed for Lunar New Year Mickey and Minnie, Pluto, Goofy, and Chip & Dale. By Silly Symphony Swings, you can find the AP Corner which is exclusive to Annual Passholders. It has a Lunar New Year button and a photo op! By The Little Mermaid ride, you can find craft tables for kids where they can make their own paper Chinese lanterns! Overall, I thought it was the best Disney Lunar New Year Celebration by far! Be sure to visit to experience the magic by February 17, 2019.